Learn about sympathy flowers etiquette. What to send and where. Which flowers are the most appropriate and more. We take the mystery out of sending condolence flowers by answering the 10 most common questions people have about using flowers to express their sympathy. Why are sympathy flowers important? When should sympathy flowers be sent? Which flowers should be sent for sympathy? What colour should sympathy flowers be? Do sympathy flowers have to be white? Do you send sympathy flowers to a man? Where should I send the sympathy flowers? How do you sign sympathy flowers? 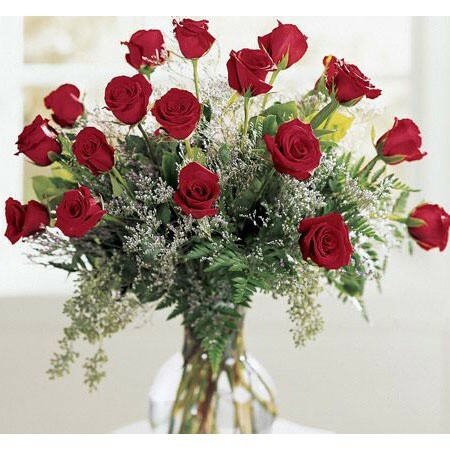 How to order sympathy flowers? 1. Why are sympathy flowers important? 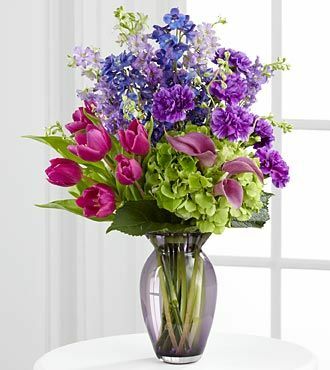 Sympathy flowers have a long tradition of being sent to funerals and to the home of the bereaved. Flowers have been used for centuries for their symbolic meanings as a way of expressing feelings and messages to loved ones. 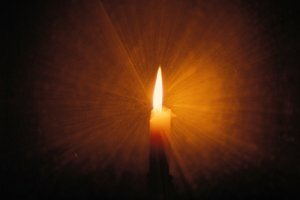 After the loss of a loved one, it can be very difficult to know what to say and how to express our condolences. Sympathy flowers help us to do this. 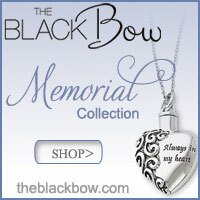 They convey our love and respect and are also symbolic of the fleeting nature of all life. in many European countries these are symbolic of death and are only used for sympathy and funerals. In the East, white chrysanthemums are mean grief and sadness and are associated with the afterlife. 2. Should I send sympathy flowers? Whether or not you send sympathy flowers really depends on your relationship with the deceased or the bereaved and also on their wishes. If you didn't know the person very well, or it is a work colleague, it might be appropriate just to send a card. Some people request donations to the deceased's favourite charity instead, or they may have a cultural or religious reason for not wishing to receive flowers. (For example, it isn't customary in the Jewish faith to send sympathy flowers). Some people might simply be allergic or just not like cut flowers! So try and respect their wishes. If you're not sure, there are plenty of other ways of letting someone know you are thinking of them at this sad time. Perhaps a phone call, even an email or a text would be a comfort. Practical help such as cooking a meal, or helping with transport for the funeral can be other ways of showing you care. 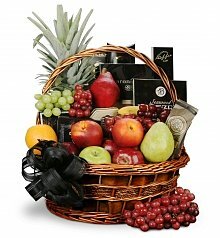 There are many other types of sympathy gifts too for situations where flowers might not be suitable. Perhaps the recipient has very little space to display them, or will be travelling soon after the funeral. 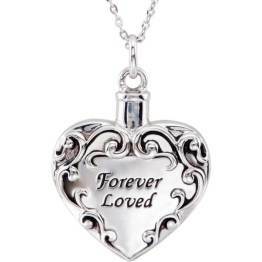 Have a look at our page of ideas for sympathy gifts to see whether something different may be more appropriate in this case. 3. When should sympathy flowers be sent? Sympathy flowers are normally sent as soon as you hear of the death, but even if you send them a couple of weeks later when things have calmed down a bit and the funeral is over, that would be fine and show that you are still thinking of them. 4. Which flowers should be sent for sympathy? Some flowers are commonly used for sympathy, such as lilies, roses, carnations, orchids, chrysanthemums and gladioli. But you don't have to stick to those. If you know that the recipient or even the deceased loves a particular kind of flower, then it might be lovely for them to receive those. Some other less common flowers could be Freesias for thoughtfulness and sweetness, baby's breath which means long lasting love, purity and innocence, Alstroemeria in white or pink for devotion or friendship. 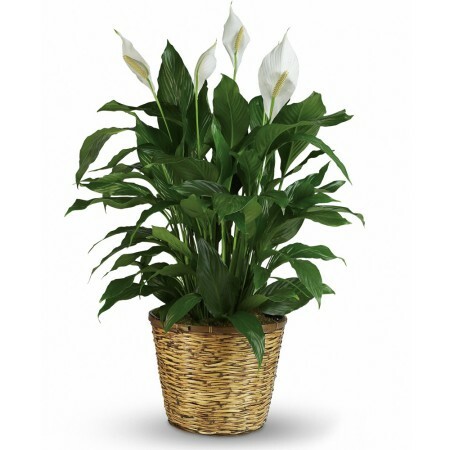 Another idea is to send a plant, such as a peace lily or an orchid which will last much longer. Most florists will be able to provide these too. Most florists will have specific flower arrangements for sympathy from which you can choose and usually they will be happy to incorporate any special requests too. 5. Do sympathy flowers have to be white? While white is the most common colour for sympathy flowers because of it's association with goodness and purity it isn't essential. Most florists will offer a range of colours and may just incorporate a few subtle pinks or lilacs to enhance the arrangement. The arrangement below is full of rich deep colours, but works perfectly. 6. What colour should sympathy flowers be? 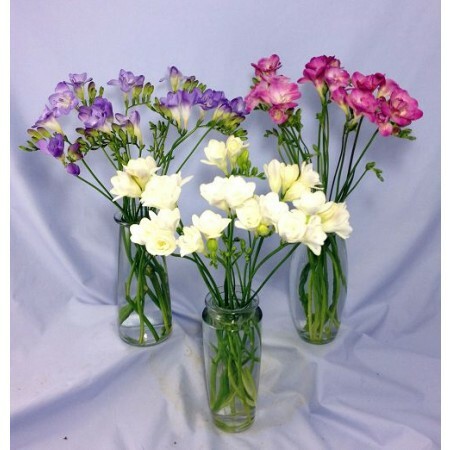 Most commonly sympathy flowers are white, yellow, pink, pale blue or lilac. They tend to be pale and muted colours as bright colours would normally be too cheerful for this sad occasion. But see the exception in the image above with deep, rich purples and blues. Be careful with yellow, as although it can mean friendship and remembrance, it can also refer to jealousy. Sometimes red roses may be suitable for expressing strong love, but in Asian countries red is associated with happiness and good luck and so should be avoided for sympathy flowers. 7. Do you send sympathy flowers to a man? There is no reason why you can't send sympathy flowers to a man these days. But we would suggest avoiding any particularly feminine colours such as pink or lilac. It might be a good idea to let the florist know they are going to a man so that they can create a slightly more masculine arrangement. A plant such as a peace lily or an orchid might be suitable too. If you know that the man in question probably wouldn't appreciate flowers, why not send a sympathy gift basket instead? These are practical as well as comforting. There are many different types these days. 8. Where should I send the sympathy flowers? These days it is more common to send the sympathy flowers to the person's home rather than the funeral. 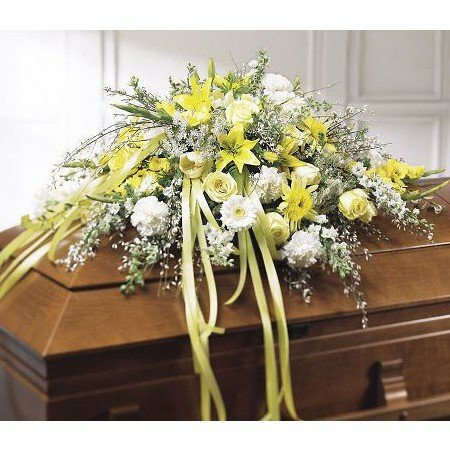 Funeral flowers tend to be chosen by the family themselves and if you send them to the church or crematorium they may get missed and won't be taken home afterwards. Sympathy flowers sent to the house can be appreciated for longer and will brighten the home and give a sense of comfort after the funeral. In the case of colleagues, you could send sympathy flowers to their office, but perhaps wait a few days until they are back at work if they are on compassionate leave. 9. How do you sign sympathy flowers? Sympathy flowers only need a short message of condolence. We have many pages of sympathy wording for you to get ideas. 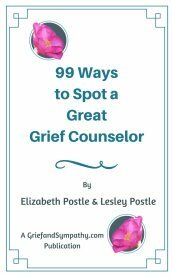 Use a short condolence phrase, or choose from short poems or quotes. Make sure you put your full name too so the recipient knows who sent them. 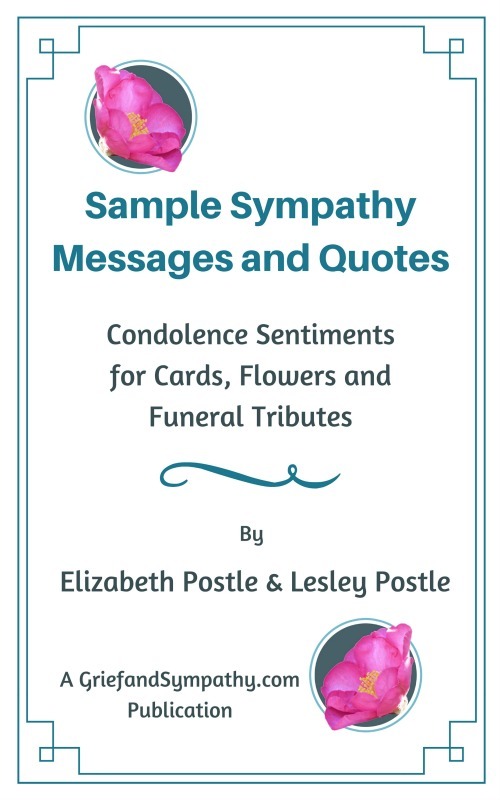 Or download our book instantly and have a huge range of sympathy messages for all types of losses. Also available in paperback. 10. 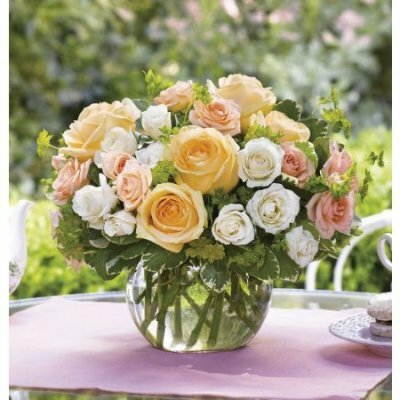 How to order sympathy flowers? Ordering sympathy flowers online is very easy. We have partnered with a company in the USA and also with Interflora UK who will deliver worldwide. We have used both of these companies ourselves and they have been highly reliable and have delivered beautiful arrangements. (To be upfront, -if you order through either of these companies, we receive a small commission which helps us to continue supporting the grieving through this website). 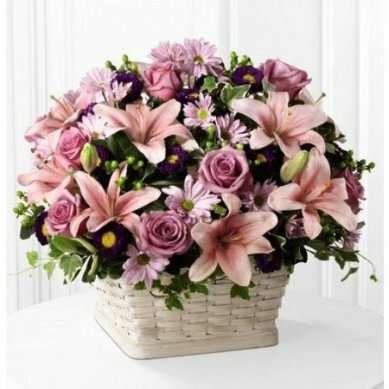 Click through one of the links below to the main sympathy flower page or the international delivery page and follow the prompts. Choose your arrangement and click through from the image. Some arrangements have different price points depending on size. Select your arrangement if so. Fill in your message and who the flowers are from. Fill in the address of the recipient. You normally need to put in their phone number too in case they are not in when the florist tries to deliver. Interflora UK - delivers worldwide - accepts all major credit cards and paypal.